How does your sugar intake change from week to week in your monthly cycle? If there’s one thing you should know about me, it’s that I have a huge sweet tooth. Wanna get on my good side? Offer me cake, cupcakes, cookies, macarons, candy, chocolate-covered potato chips, root beer floats or, my new favorite, mini-doughnuts. I will be yours forever. There’s no need to remind me how bad sugar is for you. As a longtime health journalist who reads the latest medical research on a daily basis I know all the many ways sugar can impact you negatively (which I won’t list here because I don’t feel like bumming out my fellow sugar lovers). But, I don’t care what the studies say. When I get a sugar craving, all I hear is blah blah blah right before I dive headfirst into my favorite sweet confection. So, as you can imagine, I was curious how my hormones impact my love of the sweet stuff throughout my cycle. Disappointingly, the research is pretty thin on this topic. And the few studies I did find had seriously small sample sizes. Which surprises me since you’d think sweets-loving women like me would be lining up to volunteer for a study that involved eating as much sugary foods as you wanted over several cycles–all paid for by whatever university was sponsoring the sugarfest. But, the few studies that I did find were interesting nonetheless–and if you’ve got a sweet tooth, you might find this interesting, too. Generally speaking, during the first half of our cycle, we eat fewer sugary foods the closer we get to ovulation; during the second half of our cycle, we eat more sugary foods. The reason? As estrogen rises higher and higher, it makes our taste buds more sensitive to sweet flavors–so we need less sugar to activate the reward centers in our brain and feel satisfied. 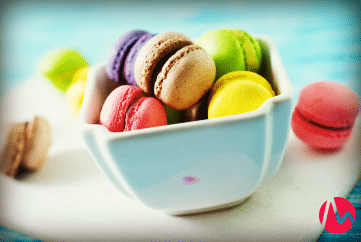 By contrast, during the second half of our cycle, lower estrogen combined with progesterone makes our taste buds less sensitive to a sweet taste–so we need more sugar to activate the reward centers in our brain and feel satisfied. First off, this new study in the European Journal of Nutrition is notable not just because it’s the latest addition to this topic, but also because it included a larger number of women (259 between the ages of 18 and 44) and examined them across two cycles–a bit more comprehensive than the other studies I’ve mentioned so far. The results of this research found that our cravings for sweets, and chocolate in particular, peak in the second half of our cycle. This study found that chocolate consumption does not differ between menstrual cycle phases. In this study, women surveyed said they experienced a spike in chocolate cravings during menstruation and the middle of their cycle during ovulation. This study of post-menopausal women found that fewer of the women in the study than expected experienced chocolate cravings. The researchers took this to mean that chocolate cravings likely aren’t prompted by plunging estrogen–which occurs both premenstrually and post-menopausally. This study comparing perimenstrual (the days right before and during your period) chocolate cravings found that more American women than Spanish women consume chocolate premenstrually, suggesting that chocolate cravings are cultural rather than hormone-fueled. What’s this mean for you? That if you ever come across an ad from a researcher seeking volunteers to examine sugar or chocolate consumption across the menstrual cycle, sign up–they clearly need the help! Other than that, enjoy your sweet treats keeping in mind that your hormones may be impacting how much flavor you’re detecting based on where you are in your cycle, which can affect how much of the sugary food you eat. And pay attention to which days of your cycle you’re more likely to indulge. You might discover there are specific days your consumption spikes every cycle. Sounds good to me! Sign me up!